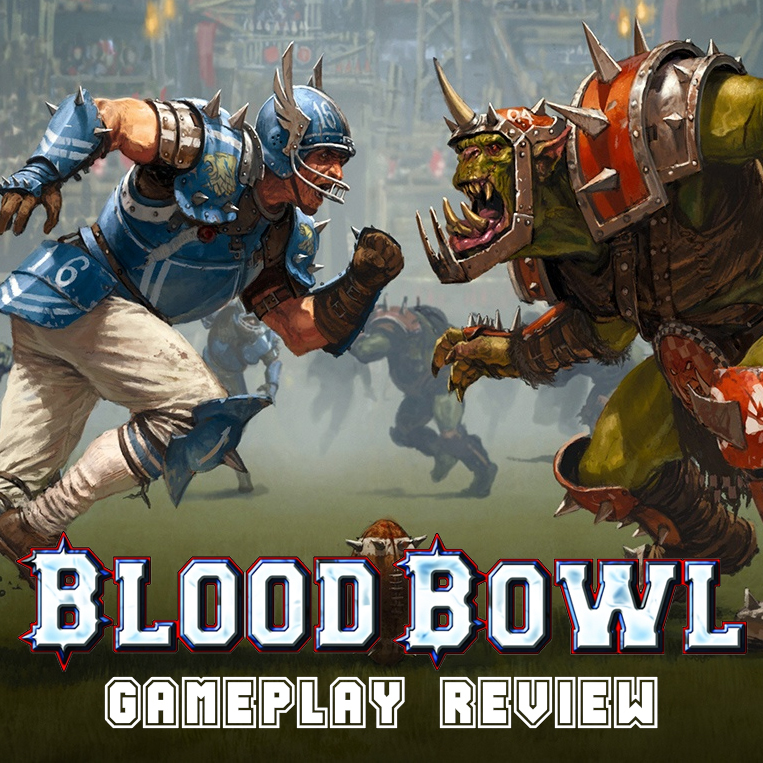 Last week I had my review of the contents of Blood Bowl and today I have my overview of my first game. As soon as I got my copy I put everything together within two days and called up my friend. 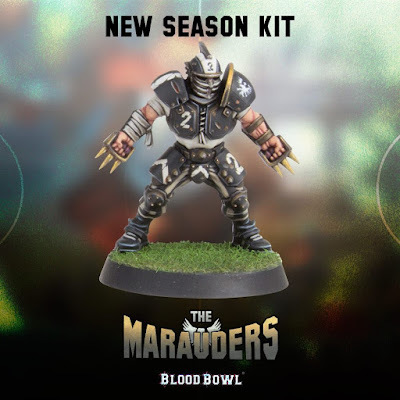 So how does the game play and feel to a Blood Bowl newbie like myself? I was pretty lucky in the fact that my friend is a veteran of the game. Even though he hasn't played in years, the rules came back to him fairly quick. To be honest, he had a better grasp on the rules then I did and I just finished reading the rulebook the night before. This is due to the fact that, according to my friend at least, the rules are pretty much the same as the living rulebook that's online right now. There are a few tweaks here and there, but nothing major. This is great for veteran players since it will still feel like the same game to them. For a newbie like myself it was easy to pick up and after one game under my belt I think I can confidently say I have all of the basics down. The game is fairly fast paced once you get the hang of it. In fact, in the rulebook it recommends timing each turn to only be four minutes. He took the Orcs and I took the Humans. We rolled for the weather table, but didn't get anything. After flipping the coin to see who was setting up first I won, meaning I was also kicking off. After you kick the ball, but before anyone from either team moves you roll on the Kick Off table to see what happens. There are a bunch of results you can get, like gaining extra re-rolls, or an extra turns, but the one we got right off the bat was a fan throwing a rock at a player. After randomizing it one of his Blitzers ended up getting a rock to the face and dying before the game even started. This was quickly followed up by him playing one of his Special Play cards and blowing up one of my Linemen with a mine. We both drew a random number of Special Play cards before the game started. He got two, I got one. With us both already a player down a piece the game was on! Orcs are tough. Super tough. They pretty much roll right threw your lines as a Human player. It probably helped that my friend had a better idea of what he was doing too but either way, his Orcs rolled right up the field. Each player gets eight turns per half, alternating back and forth. There are a ton of things that can cause a turnover in this game. If one of your players get's knocked down, if you drop a ball, miss a pass, or score a touchdown just to name a few. If you suffer a turnover than you turn ends immediately and it goes to your opponent's turn. This makes it pretty risky to do certain things, like dodge, since if you fail then your turn is done. This means you really need to pick the order you do stuff in carefully. Each player has a movement value, which tells you how many squares they can move, with the field divided up into squares. Every time you dodge, pass a ball, catch a ball, or a number of other things, you need to take an agility test and consult a chart with various bonuses or penalties. Luckily they included all of the rules on a double sided piece of card stock for quick reference during the game. My team spent most of the game getting knocked onto their backs from the Orcs. To block you roll a special block dice and consult a chart to see what happens. If you are stronger then your opponent you get to roll two dice and pick the result you want from the pair. If they're stronger then you than you still roll two dice, but they get to pick the result. You can help this by having other player's assist by standing next to the player you're blocking too. His Orcs ganged up on my guys a lot, and he was pretty smart about the order he took my guys out in. If a player is in an opponent's block zone, or the squares immediately surrounding them, then they can't assist anyone. He would take out the guys who would have been able to assist, meaning my puny humans couldn't do much of anything to take down the Orcs. I think I knocked down a grand total of three of them throughout the game, and only injured one of them. If a player gets knocked down then you roll two D6 and compare it to their armor value, if it's higher then it then they get injured. You then roll on the injury table to see what happens. The most common result is Stunned, which just means they can't do anything for a turn, but you can also temporarily take them out of the game with an injury, or even kill them. He scored a touch down fairly easy on his first drive. Once it was my turn to receive the ball I knew I couldn't compete with him through strength, so instead I relied on passing and running my Catchers. The Human Catchers are really fast, able to move eight squares a turn. An Orc can only move five. I went for broke and passed the ball to a Catcher who caught it then tried to run down the side of the field. When you pass a ball you have to use the special Passing Ruler they have to see what zone the receiver falls into. It can either by a Quick Pass, a Regular Pass, a Long Shot, or a Long Bomb, with the longer the pass meaning the harder it is to do. Unfortunately my Catcher got taken down at the goal line. I ended the half down two points with a score of zero for myself. Luckily during the half though you regain all of your team re-rolls. Each team gets a number of re-rolls. You can "buy" these when you make your team, although they include quick start rules for this telling you how many re-rolls you get if you just take the teams as they are in the box. I had four re-rolls per half, which you can use on anything. In the second half I finally managed to score, using the same strategy as last time. I just outran his guys, and with a bit of luck managed to get into the end zone. On the last play, when he had the ball again, I played my own Special Play card. This one had a second ball generate on the board. When the first of these two balls is ran into the end zone he would have to roll a dice and on a 1 - 3 that wasn't the real ball, the other one is, and no point is scored. Luckily for me that's exactly what happened. I tried to stop him from getting into the end zone at all, but my player who blitzed him literally just bounced off of his Orc, knocking himself down instead of the other player. The game ended a 2 - 1 win for the Orcs, but it was a ton of fun. There are so many other little rules that I didn't even mention, like Going For It, and Blitzing. This is definitely a beer and pretzels game, but also takes a good amount of strategy and thought. I probably could have set up my team better a few times. Like I said, it took me awhile as I was getting a grasp on the rules, but once I knew what I was doing the game started to pick up speed. I think you could play a game of Blood Bowl in an hour and a half easily. I'm already working on painting up my Human team as the Marauders, the black and white team. Maybe they will get a new sponsor when I play them and go by the name of the Mengel Miniatures Marauders. I am of course super excited for whenever they get around to the Tomb Kings, but the Skaven also look really nice. I will probably be picking up the game supplements they come out with, and at least a new team here or there. I'm eagerly awaiting the release of some Star Players so I can add Griff Oberwald to my team roster. The gameplay is fast and frantic, which perfectly reflects the zany backstory for the game and the overall feeling they were going for. This is just a light hearted game of football, you know, where people get killed and stomped into the ground. Well, compared to normal Warhammer this is a light hearted game of football. While for me personally, I don't see this becoming my main game, for others it easily could be. With the upcoming inclusion of league rules and seasons there is a lot more depth that can be added to it, keeping it fresh for years. For me this will be a secondary game, but one that I will probably add onto in the future as well. If I ever want a faster game then AoS or 40k I can easily see myself getting out Blood Bowl. This is a great intro game for non-wargamers as well. My wife has little interest in playing any wargames, but with Blood Bowl I may be able to tempt (trick) her into at least trying it out. She's a diehard Packers fan and much more interested in actual Football than I am. If you have any friends who are sports fans that you want to try and rope into the hobby, this may be a good first step. Who knows, once they have their Skavenblight Scramblers on the pitch, it may be a short skitterleap over to collecting a Clan Pestilens or Skyre force for AoS.